But, all the panic was unnecessary … the Oellermanns are absolutely amazing people and gracious hosts who had so much insight and helpful guidance for anyone wanting to improve their farming operations. HOW DID YOU HANDLE THE DROUGHT? Managing Costs: You need to be careful about input costs when you know your output is going to be cut. Look through all your cost centres and make adjustments. Labour: Among the areas where cost savings are easiest is labour. Make sure that you are running a lean team. Fertiliser: If the crop is not growing, excess fertilizer is a waste – this may seem obvious but many, in their fervor to stimulate growth, may continue with normal climate application routines instead of making adjustments. Closely tied to this is the value of split applications: consider halving the amount of fertilizer applied, monitor the situation and decide whether (and how much) of a second application is required. You may save more in fertilizer costs than you spend in application costs. Harvesting operation: The “Rands” are in the quality not quantity. Watch topping height, base cutting and burn to crush times. Transport is one of our big input costs – reduce fibre and foreign matter being delivered to the mill as you are paying for this. Furthermore, excess fibre and foreign matter will affect your RV %. Be proactive: analyse your crop so you know exactly what it does and doesn’t need. Tough situations such as drought means we need to get smarter and more in tune so that we don’t waste any precious resource. Do soil samples, send in for leaf analyses – be sure that you give your crop only what it has to have and you can only know that by regular analysis. Timing: if it wasn’t a priority before, it certainly will be in a drought. All processes in the business need to be carefully timed so that you maximize benefits and minimise negatives. Examples of this is the split application of fertilizer which reduces your risk of loss of fertilizer in extreme weather conditions. Starting healthy: This is such sound advice – going into a war-zone with a strong and healthy body is really the only way to do it. If you wander in to a compromised environment with less than optimum health, you are bound to fall ill and you may well not survive, depending on the duration of your stay … and so when we are faced with an impending drought, we should ensure that our crop is “fighting fit”, giving it the very best chance of surviving (and hopefully paying a bill or two along the way). Consider new techniques: Trashing/green stick farming – the trash blanket on the earth will help moisture retention in the short term and in the long term we will see great benefit in our soil health and drought tolerance. Basil believes strongly that the immediate increase in costs related to greenstick harvesting will be offset in the long term by increased yields and a more stable crop on an annual basis. Fertilisers: This is a department where cheapest is often mistaken for best. 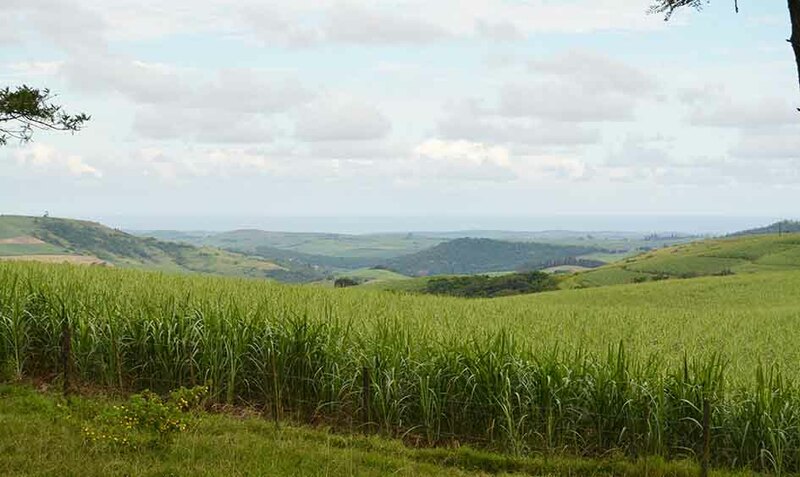 Nitrogen is one of the main requirements for a healthy sugar cane plant to attain maximum yield. Both Urea (46% nitrogen) and LAN – Limestone Ammonium Nitrate (28% nitrogen) products can be used to add the necessary nitrogen required. 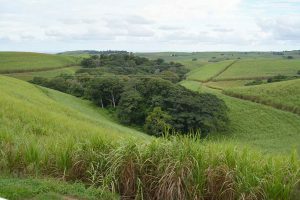 Basil’s personal opinion is that the Urea-based products, used by most cane farmers because of the price, is often more expensive in the long run. If a farmer wants to apply 120kgs of nitrogen to the soil, he would need about 428kgs of LAN but only 260kgs of Urea – making the LAN appear to be a costly option. However, nitrogen losses can occur via volatilization when Urea is used. Urea needs to be converted to an available form of nitrogen (ammonia), and it is during this process that loss can occur. This is exacerbated by high pH, a drying soil and hot wind. These losses can be significant as shown in work done at SASRI. Basil avoids this risk by using an Ammonium nitrate form of nitrogen. Basil uses a modified form of LAN called Greensulf, which includes Calcium and Sulphur – both essential elements for growth. 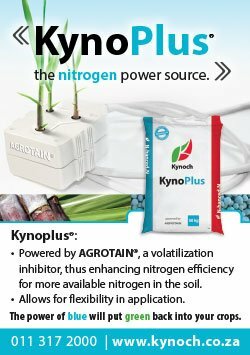 This product allows Basil to apply nitrogen topdressing regardless of the environmental conditions, without running the risk of nitrogen loss via volatilization. Greensulf (LAN) is therefore far more forgiving and Basil’s view is that it accomplishes the job of adding the essential nitrogen in a more effective manner, taking cost into account, in that he is confident of the amount of nitrogen being applied and is not guessing how much has possibly been lost. In addition to the cost factor comes the concern about soil acidity. Urea has a greater acidifying effect on soil than LAN. High acid saturation levels in sugar cane soils is now recognized as a major factor impacting negatively on cane growth and soil health. Root development can be restricted and therefore the crop cannot make use of the whole soil profile, resulting in much needed nutrition and moisture becoming increasingly unavailable. So, if we go back to the statistic that only a few farmers use LAN-based products, it becomes clear that most farmers can consider this suggestion and its advantages. Basil is convinced that his choice of nitrogen (Greensulf) is the right one and would encourage other farmers to consider using this product. These become important additives because of the aluminium toxicity mentioned above. And, a simple glance over the sugar cane farming landscape (and all the white limestone mounds awaiting application) tells us how many soil issues we have, and makes you wonder how much of this could have been a result of urea … and once again, comes the lesson of penny-wise and pound-foolish: did the “cheaper” option of urea not cause long term costs in the purchase of lime? Food for thought … Anyway, lime should only be used after thorough research into what your soil needs and where and how much is needed. Lime is often added without testing the soil or assessing its needs. This is not only a waste of money, if not needed, but it may also affect the cane negatively if insufficient lime is added, impacting yield and future soil health. Another valuable pointer Basil gives is to assess your soil needs at varying depths and apply minerals that work correctly. If you have acidity issues 400mm or shallower, lime is the best choice but, because it takes so long to move through the soil profile and is difficult to incorporate at deeper levels, it won’t work if your acidity levels are deeper. This is where gypsum becomes useful – it moves through the soil profile far better and can deal with acidity levels deeper in the soil profile. Lime is essential and as it is such a significant part of your input cost, good management of the soil’s actual requirements is vitally important. Eldana is the main pest in this crop. Everyone has an opinion on this devastating little worm so it is easy to be confused and misinformed. While it is important to take advice from those around you, it is paramount that you do your own scouting – go out into the fields and assess the situation. 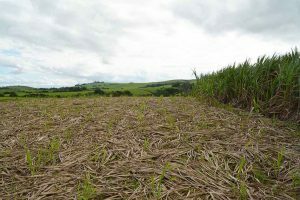 Temperature, rainfall, plant stress, nitrogen levels – all these factors play a part in the life cycle of Eldana therefore a decision to spray or not to spray must be made after assessing exactly what stage your Eldana is at … the pesticides available for this insect are incredibly expensive and spraying when the worm is inside the cane stalk achieves absolutely nothing. The only time to spray is when the chemical can come into contact with the Eldana. Know your “enemy” so that you don’t waste your money or sacrifice your crop. The Biosecurity (P&D people) teams will advise what stage you’re at – Basil advises that you listen to technical advisors but keep in mind that some of them are selling product. Make carry-over decisions based on pathogen counts and avoid blanket spraying. The key here is the right product for the right spectrum of weeds at the right time. The challenge of meeting these three requirements simultaneously can only be achieved through a good relationship with your supplier. Basil relies on Gary from Agribiz who spends time inspecting the farms with him and advises on the best plan of action. Again – price should not be a major factor in decision making. Invest time in looking carefully at what weed spectrum is in your fields and use targeted products as advised by the specialist. There are generics for most major herbicides and they are worth considering. The main advice here is to avoid using the same program you have every year – same timing, same products, without even doing an inspection – be flexible, be proactive – take each year as a new challenge – get out there, find out what you’re dealing with and use a targeted, specific approach. Spraying too early or too late can be a costly error; eg: If you spray a post emergent chemical that requires contact with leaves when only the seeds are present, you’ve wasted your money and time. Resistance challenges are also very important to factor in. Try to avoid using the same chemical year in and year out. Another point to consider in using herbicides is the effect that it has on your cane. Basil reminds us that every time you spray a chemical, it affects the cane too. We can use this awareness in dual purposes: 1. Be certain of your timing – if you time a spray poorly and have to come back and do it again at a later stage, you’ve given your cane another unnecessary set back. So, not only did it cost you the time, labour and chemical wasted, it also affected your yields. 2. Be aware of the “side effects” of the chemical you’ve chosen to apply; yes, you may spray and eradicate a weed that was present but, in so doing, you may have affected your yields substantially – was it really worth it then ? Record keeping and budgeting. Basil runs a meticulous set of record keeping books wherein he allocates labour time to specific tasks. At the end of the year he knows exactly how much time (and therefore labour cost) was spent on weeding, gapping, planting, fertilizing, herbiciding, bushline maintenance and other areas. This information can be used to assess the success of his spraying programs. Knowledge is power – Basil advocates collecting this data and using it to make decisions for the following season, thereby improving every year. If he sees that he “spent” more labour weeding this year than he did last year, it’s an indication that something needs to be revised. A labour saving in the weeding department means he did something right and he can follow that route, with enlightened improvements, for the following season. If you don’t keep these kinds of records it makes assessing a previous plan of action impossible. “Rather catch the seed than the weed”. Long term cover is achieved through using pre-emergents. “prevention is better than cure” – so rather stay in a situation where you can make use of pre-emergent chemicals more than have to deal with post-emergent, short-term solutions. It is however, a reality that both post and pre-emergent chemicals will have to be used. Post-harvest cleaning: some farmers have moved away from doing this but Basil makes sure that his fields are cleaned up after a harvest. It is in this activity that he manually removes all the old stools of tough grass that are completely resistant to all chemicals. These weeds are taken OUT of the field. He also uses this labour in the field to spread all the cane tops which adds mulch to the soil. HOW DOES BASIL CARE FOR THE ENVIRONMENT ? By employing “informed spraying” – don’t ever spray unnecessarily or without knowing that this is the least you can do to manage a real threat optimally. Bushlines are important on Basil’s farms. He spends a lot of resource in maintaining them and allowing them the area required. One of the reasons Eldana is such a threat today is because bushlines were disrespected and the natural habitat of the Eldana (wetlands) were invaded by ignorant farmers who then put sugarcane onto the Eldana’s dinner plate. The decision to go back to green stick harvesting and minimise burning. HOW DOES MECHANISATION FACTOR INTO YOUR OPERATION? Basil’s farms are harvested manually so soil compaction is not a significant factor. An area where it does become a challenge is in the use of caneloaders. Basil employs these vehicles in the flatter areas and loads manually where it is too steep to run a loader. Both soil compaction and ratoon damage are concerns where the loaders are used and Basil manages this by using flotation tyres. These are far more gentle on the soil and ratoons and the results are evident in the strength of the stalks seen the following season. Again – keeping an eagle eye on the farm will allow you to see where the soil has become too compacted and a simple run through of a ripper will loosen up the soil and help the next crop. Educating and monitoring drivers is an important activity when using tractors. Basil has tracking systems on each vehicle and educates the drivers to stay out of the fields, regardless of how tempting it may be to cut the corner … the tracking device lets him know which drivers need refresher lessons on how to respect the soil and stay out of the fields. He also makes sure that the drivers understand WHY they need to stay out of the fields. Education is paramount. Basil runs a lean and mean fleet. He doesn’t believe in “spare” tractors but instead he ensures that every machine is at prime working condition so that there is never a need for an “understudy”. 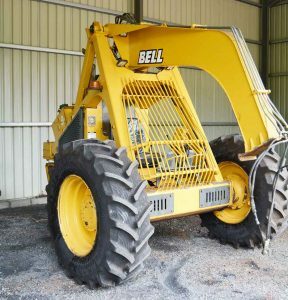 The machines are sold after 10 000 hours, regardless of their condition, and make way for a brand new machine. Turning wheels are productive wheels. Downtime is costly and Basil’s plans work to eliminate it completely. 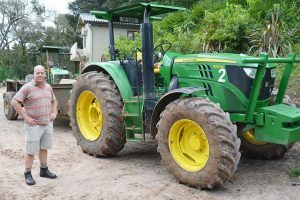 That’s part of the reason he chooses to run John Deere machines – although he has faced some challenges of late, he relies heavily on their after sales service and the confidence in knowing they will be there to sort out any issues is priceless. Efficiency is also an important factor when selecting a machine. Basil and I discussed fuel and I was intrigued to discover that he uses 50ppm diesel. Even though this is more expensive, he believes it is worth it when the long term advantages of using a higher quality fuel are taken into account. Again, it comes back to a strong theme on this farm – don’t assume that cheapest is best. Do the maths so you KNOW what is best. Basil believes strongly in running a high level of quality when it comes to this high cost centre of his business: he advises that all equipment is maintained properly, even if it doesn’t directly affect the efficacy of the machine eg: if a seat is broken, fix it. While this won’t necessarily be a direct impact on profit, it goes a long way to breeding an environment that emphasizes the value of quality and maintaining all assets in peak condition. Driver training is very important and to then put this training into practice and reinforce it with a culture of excellence breeds an environment that can sustain a healthy business. Put simply – after time, the staff will emulate your ways – care for the business and they will too. Disrespect the assets, and they will too. There’s just no getting away from the fact that people-management in any operation is difficult, regardless of whether it is a high-rise building in the centre of the city or out on a sugar cane farm in Doringkop. For the 2016 year Basil averaged, over 11 months, 21 units of casual labour and 2.5 drivers / Indunas to complete all tasks required on the cane section. This excludes harvesting staff as this is done by his harvesting contract business which also harvests for five of his neighbours. Here he employs around 100 seasonal cutters; approximately 20 of those stay on a little longer and are used in the seedcane division. 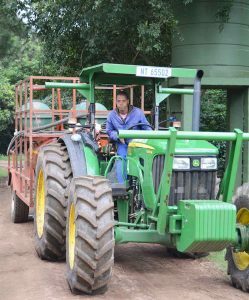 As with Basil’s equipment, he runs a lean force of employees on the +- 430 hectare farm. Another common theme reappears: QUALITY – only the best will do and Basil is grateful for his main Supervisor and select, excellent tractor drivers. He fosters a culture of promotion from within the business, thus incentivising all to aspire to grow in the operation and enjoy reward from their involvement. Production incentives are also a perk of being on Basil’s payroll and this was a strategy he managed carefully through the drought so that the negative effects on the labourers’ wages were minimized. Through all seasons, the incentives offered discourage absenteeism which helps Basil run a more reliable work-force. 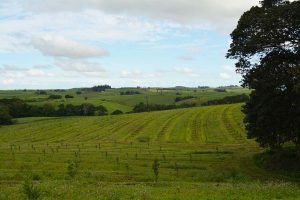 The early days of cultivation in this area saw the land producing wattle and some coffee. When sugar became a more lucrative commodity, it replaced some of these earlier crops. Basil settled here in 2003. He had grown up in the area but moved away for a period to broaden his experience farther afield. Being able to buy the farm he currently lives on was the reward for hard work, commitment and sacrifice. He and Trish have built a beautiful home from the initial homestead structure – quality and style oozes from every corner. Land claim has been a very real issue that the Oellermann’s had to face head-on. 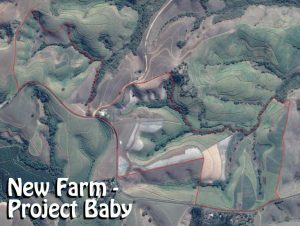 Shortly after purchasing their farm in 2003, it was gazetted as being under claim and the mammoth task of investigating the validity of the claim began. After lengthy negotiations a settlement was reached between farmers and community. 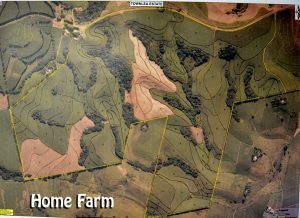 Since then they have lived with the new owners of neighbouring farms in very close proximity, to the point where access to the homestead, workshop and office actually traverses claimed land. Despite this, peaceful co-habitation reigns – a tribute to Basil’s firm sense of fairness in all his dealings. 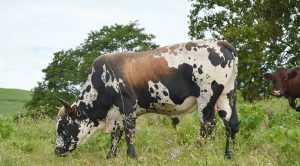 Besides the 400 hectares of cane, 21 hectares of Macadamias and a further 10 hectares, currently committed to another project, there is Basil’s “hobby” – cattle. The existing Sussex herd has been spiced up with some Ngunis and there is now a mixed heard of 43 animals. Including what is probably the most magnificent Nguni bull I have ever seen. About 30 hectares of the farm are committed to grazing. “Planning and management is key: Have a plan – winging it is not my advice. Base your plan on experience and forecasts, budgeting is vital in my business and guides me through the success / failure of previous plans and prepares me for the next step. Once you have a plan, manage it – be active and involved and above all, be flexible. Watch your burn-to-crush delays as these can be unnecessarily expensive. Top cutting is a critical activity that can be costly in both directions. To gain the optimal point and make sure that is adhered to requires management but can have a profound impact on your quality delivered to the mill. HAS CRIME BEEN AN ISSUE ? No. As far as Basil knows, the farm has always been fortunate in this area. There have been cases of isolated petty theft but nothing distressing. He advises farmers concerned about crime to remain vigilant and become more aware. “We have 7 dogs on the property – one Boerbull, one Bull Mastiff, three Jack Russells and two Staffordshire Terriers – a nice mix of sizes that cover our awareness and cautionary challenges well.” Historically, farmers have not thought about burglar bars and alarm systems until something goes wrong – Basil advises that we become proactive in this arena rather than wait to be forced into a reactionary position after a devastating event. Basil spends up to 60% of his time in the farm office. Perhaps that has to do with the fact that his beautiful wife, Tricia, is to be found there throughout most of the day, but let’s give him the benefit of the doubt when he says that he strongly believes that his farming success is largely attributable to the time he spends planning, assessing his budgets and, monitoring costs and finances. After matriculating, Basil went on to do his national service and then pursued a career in Mechanical Engineering. He soon realized that the full-time indoor requirement of this career did not suit his character and moved back to the land, farming for Crookes Bros. Here he went on many courses and learnt so many practical lessons about farming, including the critical importance of planning and budgeting. Basil believes practical farming can be learnt far easier than the commercial aspects of running an operation – he therefore suggests that, if there is a question about what formal education an aspiring farmer should invest in, it should be business related – a BComm or similar degree would be most helpful. When I asked Basil whether he has any mentors or heroes, he was quick to lay his success squarely at the feet of God – there is no one else he would call his hero. As far as mentors go, he gives due accolades to his father and uncles, all of whom were highly successful and valuable teachers to him. Basil also pays tribute to John Osborn, a neighbor and advisor whom he values highly. Primarily though, Basil pays due respect and gratitude to his partner and wife, Tricia, without whom, he would not even be able to bank (literally) … there are certain parts of running this operation that Tricia does alone and he is happy having that completely reliant partnership – it requires complete transparency and trust. Tricia manages all the admin, record-keeping, accounts, wages etc etc etc and her simple advice is: “Stay on top of the admin.” This may seem elementary but one has only to experience the consequences of letting it go for a while to realize how vital these simple words of wisdom are. Witnessing the obvious adoration between these two in this 23-year old union was special and I can see that it is a cornerstone of the success at Townlea Estate. 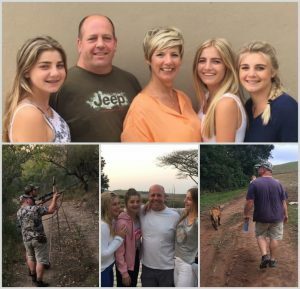 Their other pride and joy are their three teenage daughters – besides being beautiful, they have been an absolute delight and part take in all farm life activities and enjoy all dad’s hobbies. They too are successful students all giving of their best no matter what task lies ahead – a quality they have most certainly inherited from their parents. Strategic planning. This activity takes you to a healthy distance from your farm. 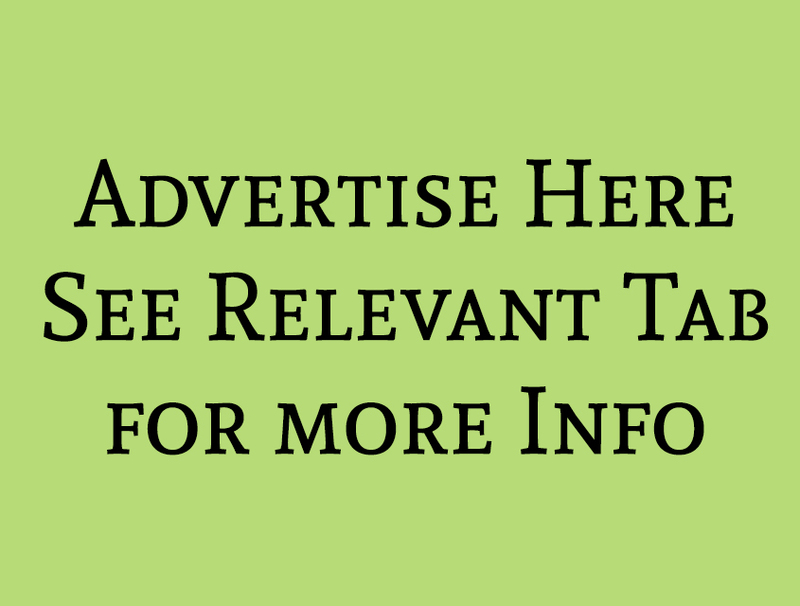 From here you can look at it for what it is: a source of revenue, and manage it as such. Consult the expertise available (neighbours, study groups, suppliers etc) Even run small trials on your farm. Better to learn small than to risk big. Establish what your long term goals are (where you want to be 5 years from now) and what short term goals will feed into those. 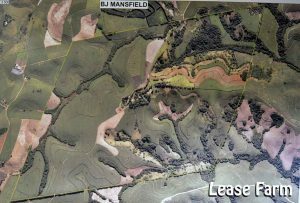 With regards to short term plans – you can consider reviving poor areas on the farm in order to make a short term impact on cash flow, and then have a longer term plan that involves replanting with a different variety. Compile a plan that will achieve the goals set – incorporate budgets (remember to focus on cashflow) and take note of resources required. Look at each operation critically. Start implementing the plan … Cut out what isn’t working and focus your energy on the elements that show potential. Monitor progress, reflect on the budgets and the timelines set and remain flexible. Knowing where you want to go and how you plan to get there is as relevant in your farming operation as it is when considering any kind of journey. A destination and a map/GPS are not optional. Every year Basil does a cost analysis to ensure that he is getting the best price on all his inputs. Just because a rep has been seeing you for the last 50 years does not mean you have to buy from him. Service levels are important and need to be factored in but a detailed cost study is as important. 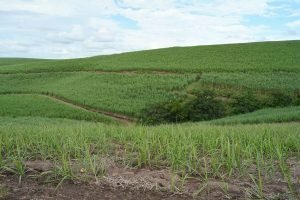 Sugar cane farming is quite forgiving when compared to other crops. It is not too difficult – it’s quite hard to mess it up. But, often because of this, complacency can creep in so easily because it is an “easy” crop. You need to resist the temptation to become lazy. A learning attitude (Study groups). Take advantage of the talks and seminars that the Extension Officers offer. Everyone can learn. Never stop learning. Putting your pride in your pocket. Realizing that a chosen course of action may indeed be flawed and have the wisdom and humility to accept that and make changes. Box smarter rather than work harder – plan, strategise, focus on timing and doing things at the right time. Budgeting and bench-marking – keep records and stick to plans, all the while trying to improve and use the information to plan for the future and assess strategies. So much of Basil’s success can be attributed to thorough planning. 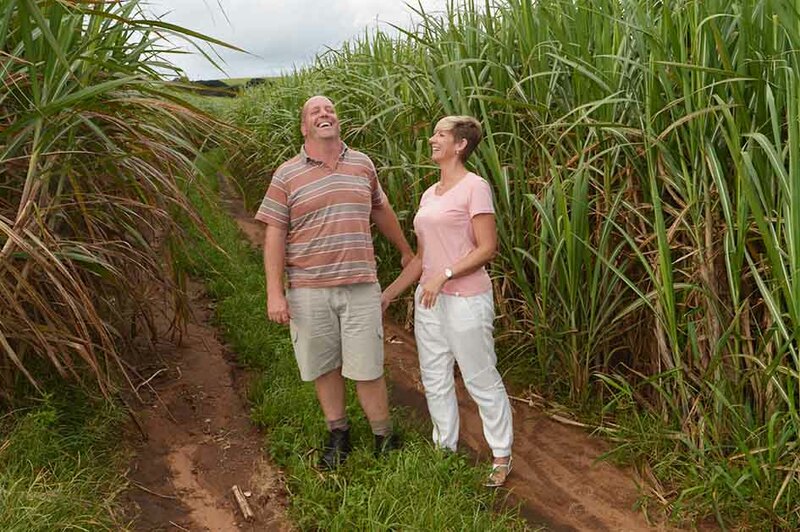 Thank you, Basil and Tricia, for being the very first to share the reasons behind your phenomenal success with SugarBytes and, in turn, the South African sugar industry. Your time and insight is priceless.